Financials (UnAudited) out – 61 BILLION shares outstanding ! Is there even a question as to who’s shares you are buying if you decide to make a purchase??? 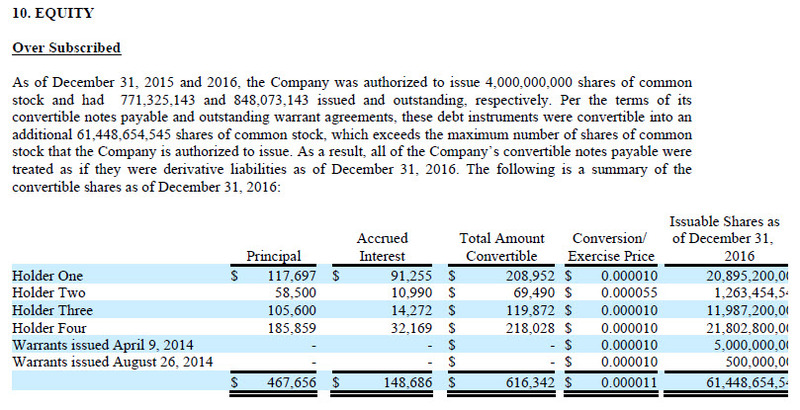 And the hits just keep coming… the company is almost 1-million in debt. And… just to give you a little flavor as to the validity of the document, there is this piece about a lawsuit that they state “The company finds no merit in the allegations and will vigorously defend the suit.” WOW… this appears to be the very same lawsuit we reported on here, AND, Mr. Steven Samblis AGREED to a settlement of it. Folks, we spent about 10-minutes with the document, so more to come later, but we still see nothing that proves Mr. Steven Samblis does not own the company. Investors might consider that a person can be CEO, President, and Chairman of the Board…without actually “owning” the company. They are just titles. Investors still have not seen the terms and conditions of the “Private Transaction” that was widely publicized as the “Sale” of the company to Mr. Siriani. If either of these two gentleman really wanted you to know the truth… they would publicize the document, and file it with the SEC. This entry was posted in Uncategorized and tagged IMTV, Joseph S Sirriani, New Financials, Steven Samblis by blog_VUTV. Bookmark the permalink.